The newbie FAQ, and guide to all things Mediavine! First, we want to make one thing clear. We’re not an “ad network.” We’ve learned that in this industry that’s a very loose term being thrown around. Generally they’re just run as black holes where all you know is someone is putting ads on your site and sending you a check. What you often don’t realize is how little they’re doing, and how little value they’re bringing as middle men to middle men. In fact, we’d argue most of them are actually destroying value by taking your valuable website and lowering the value of your ad placements. What we’re doing is offering full-service ad management. We want to help you represent your advertising inventory in the best way to the best advertisers for the most money to you. Why do you need exclusivity to my ad inventory? In the past, ad networks worked kind of like a pyramid. All these individual publishers fell under one big ad network, and then they would add “waterfall” networks behind that first one. When you do that, each ad network - the big one and all the little ones in your waterfall - get the authority to list your site on the ad exchanges. Each at their own price. Let’s put it this way - if you went to the grocery store, and the exact same apple was 1.99, .99, and .39 based on which checkout lane you went through, wouldn’t you still go through the .39 lane, even if it it had the longest line and took you longer to get in front of that checker? That’s exactly how your ads have been working. A lot of advertisers will choose to go for the lowest rate offered on a particular site’s inventory, even if it means they’re sitting in backfill. They’re still getting the audience they want, and at the cheapest price possible. Especially since they know there’s no way the higher-tiered networks are operating at 100% fill. What’s worse is if you have multiple ad units with multiple partners, you have a bunch of these pyramids. Or going back to the grocery story analogy, by putting a bunch of ads at the bottom of your sidebar, you’re actually letting a Wal-Mart and other discount stores sell those same apples on your site for even cheaper. By giving Mediavine exclusive access, we’re going to list your website one time on all the ad exchanges, at one price. We're not an ad network, and we don't operate like one. If advertisers want your premium demographic of traffic, they’ll have to pay that one price. And believe us, they will. Why do we know this works? We’ve been doing this on our own sites since 2015, and more than 4,000 publishers since then, and it’s working spectacularly. So well, in fact, that Google agreed to us being a Certified Publishing Partner. There’s another, more technical reason for the exclusivity too. The deals we’ve been able to obtain right out of the gate with super big advertisers are entirely prefaced on having exclusivity on any of the sites we bring to the party. We simply can’t include you, contractually, in those super high paying deals, without an agreement of exclusivity in place. So that’s why the contract you’ll sign is written that way. However, remember that this exclusivity applies to display ads only. The biggest difference you’re going to notice is you’re not running traditional ad tags with Mediavine. You’re running a single script. That’s because as part of that full service advertising representation, we’re not just running the ad server and ad deals, we’re also optimizing ad placements. How well your ads perform (think about all those metrics you’ve heard about over the years - viewability, click-through rates (or CTRs), etc) is how well you’re going to do. That, and we’re selling deals across Mediavine as a whole, so we need consistency. With each site, we start out with our standard ad placements, which we’ve decided on based on years of research, both in the industry and our own experiences. Our goal is to trial each placement to see what makes you the most money while still providing a great user experience and meshing well with your site’s design. We’ll always work with you until you’re happy with an ad placement or remove it if we can’t make it work. These units will appear at the very bottom of the page on mobile, desktop, and tablets. They are highly viewable and great performers across Mediavine. This unit will appear at the very top of your sidebar. It will render as either a 300x250 or a 300x600. The Leaderboard and Top Sidebar ads are the only two ads that we sell as “above the fold” and they’re also the only two ads that will load when your site loads, to increase your site’s speed. Everything else is “lazy loaded” - meaning it won’t try to load until a user scrolls near it. This unit will appear at the end of your sidebar. As the user scrolls past the end of the sidebar and there’s content to continue reading, it will stick to the top of the screen. The key to this unit’s performance is as short of a sidebar as possible with nice, long content, so that as the reader scrolls down through your content, the unit stays with them for a good long while. This leads to higher viewability, which leads to much higher CPMs. Since it is lazy loaded, it will not load until a user scrolls near it. Again, the way to maximize this ad is to have it load soon on the page, and scroll with the user a long time. These 300x250 ads will appear inside your actual content. They work off of paragraph logic, which is customizable in your dashboard to turn up or down the frequency in which they appear. An easy way to optimize for these ads is to write shorter, 2-3 sentence paragraphs, instead of longer ones, so that you have more opportunity for them to show. Especially on mobile, where these are the main money earners, this is an important consideration. Many of your fellow publishers will tell you, if you can optimize your content for these ads, they will be instrumental in making you the most money possible. A 300x250 that will appear within your recipe card. Users are most engaged with your content inside the recipe card, so this will be your strongest performing unit and if you have mostly recipe content, it will be a large percentage of your revenue. Believe it or not, how close this ad is to the print button will actually have a big impact on its performance. “Bouncy” users coming in from Pinterest and Facebook tend to head straight for your recipe card, hit print, and bounce out again. If they’re not engaging with your actual content, you still ought to be making good money off them - after all, you’re giving them a free recipe! So placing the ad near the print button makes sure that it gets into view for those users, maximizing your earning potential. How long does this take to make me more money? So we like to say when you sign up for Mediavine, you’re pressing the reset button on all of your ads. You were previously listing them for sale for as cheap as $0.01 CPM for ad impression. Now we’re asking more than 100-400 times more than that. It’s going to take time for advertisers to learn why they should be spending more on your inventory. Generally, it will take about 30-60 days of consistent traffic for our advertisers to learn your site’s demographics, traffic and inventory and for us to spot places to optimize further. We ask for an initial 90 day commitment because we know that we need to give the advertisers time to relearn your site, and for us to be able to work with you to make sure that every placement is making sense in how your unique website operates. But for our new style of representing your advertising inventory to truly work, we’re going to need at least 3 months for advertisers to learn to appreciate your ad inventory as premium. You should watch a nice slow and steady increase in your CPMs and total RPM over the months you’re with us. Can I run X advertiser on my site? With Mediavine Direct you now have the ability to sell ad space on your site to any brand you'd like. The brand will buy into your current auction, ensuring you don't have additional ad placements up, and you are never under-selling yourself. How do I disable ads on a page? Often with sponsored posts, the brand is going to want 100% Share of Voice (SOV) — AKA disable all other ads on a page. Or maybe you just want to disable ads on your About Us page. Either way, we can accommodate this. There is a code you can generate right from your dashboard and insert into your post or page you'd like the ads removed from. You can read more about it on our How To Disable Ads on Specific Pages guide. Synchronously is how traditional ads are run; they stop the entire page from loading as the advertisement loads. These are mostly outdated, but used to be the default that most ad networks and managers would run. In 2019, most of the internet runs asynchronous ads. That means that the ads load at the same time as the the rest of the site. Your full page can load - images, etc included, at the same time as the ads. No more waiting for the ads to go first. Mediavine adopted asynchronous ads early on, and then continued our obsession with all things site speed. There's a reason that Mediavine ads are more than 200 times faster than our competition. Lazy Loading is IT! The concept of lazy loading ads is relatively simple. When someone first goes to a page on a Mediavine publisher's site, we only load the advertisements that are in the first screen view, or what’s visible in your web browser, before you start to scroll. As you begin to scroll down and we know you’re approaching a new advertisement, our script wrapper automatically detects this ahead of time and loads that ad in time before you browse to it. We do that via what we call an offset, or enough of a buffer to give the ad time to load before it appears on screen. Lazy loading is the Google recommended way to serve 3rd party java script. What’s my cut, what’s your cut? Our revenue share is a base of 75% to you, the publisher, and 25% to Mediavine, on ads where we have the expense of the ad server. You receive 75% of gross proceeds paid by advertisers and networks as reported by our ad server, while Mediavine receives 25%. There are no other fees for administration and hosting, sales commissions or adjustments for discrepancies. If your site produces 5 million ad impressions over the previous 30 days, your revenue share increases to 80%. If your site produces 15 million ad impressions over the previous 30 days, your revenue share increases to 85%. With these changes along with our loyalty bonus, your revenue share on Mediavine display and video ads has the potential to reach 90%. We offer full transparency. Most agencies only provide you reports after ad serving fees, commissions, discrepancies, etc. For us, that’s coming out of our 25% (or 15% or 10%, depending on your ad impressions + loyalty rate for the last 30 days). Again, we do not adjust earnings at the end of the month for discrepancies or ad serving fees. What you see in your dashboard is what you get. What about partnerships, like GumGum and ZergNet? With these partnerships, the revenue share remains 80% to the publisher and 20% to us. We do not have the expense of the ad server, and that split - negotiated on behalf of all Mediavine publishers - is better than an individual publisher could receive, even with our 20% commission. In your dashboard, partner earnings are also shown with the commission already calculated. You will receive the full amount of the earnings displayed here. Anything defined in your dashboard as "Mediavine Display Ads" is calculated at the variable revenue share rate listed in your dashboard. Anything defined as a "Partner" as a line item is calculated at the 20% rate. First — the how: Mediavine Payments powered by Tipalti, a service that allows us to take on the cost of some transfer fees, and lets international publishers choose between U.S. Dollars or your local currency. You might be eligible for fees depending on the payment method you select in your dashboard. Please follow these steps for selecting a payment method. You can review this guide to help you determine which payment method is right for you. Second — the when: You will be paid NET 65. That means any money you earned in January will be paid April 5, etc. 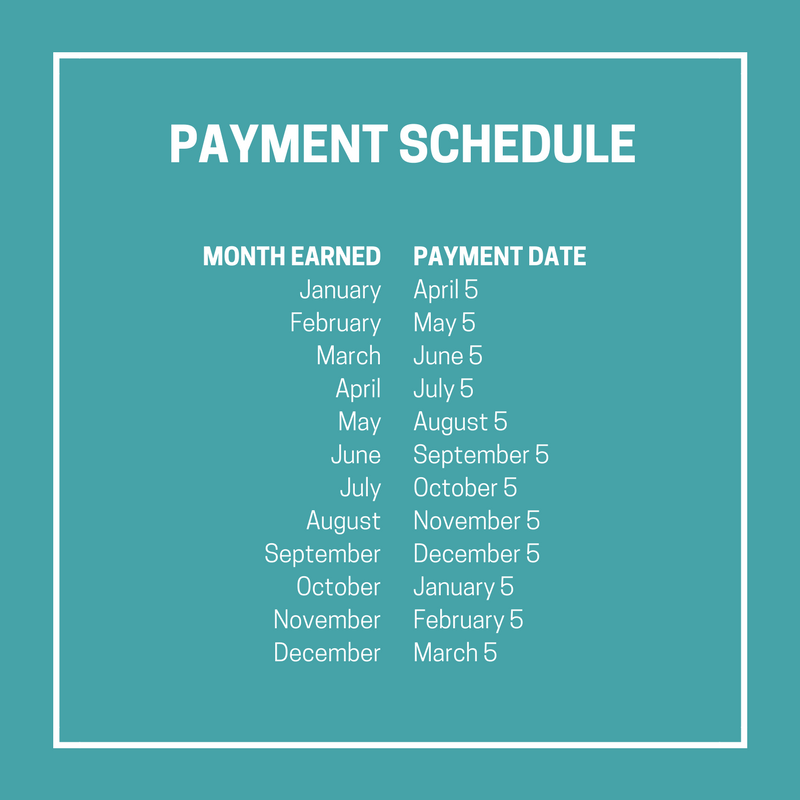 Just add 2 months and 5 days to the end of that month’s earnings to know when you’ll be paid for it. Taxes — who pays what? You’re responsible for taxes on all revenue you earn through our arrangement. Sorry, it’s the law! Here's our guide to 1099s.